The above color-rendered site plan drawing highlights the landscaping and color contrast around and between buildings. The project houses an inner south-facing outdoor courtyard space measuring approximately 24’-0” by 24’-0” onto which each dwelling looks. Everyone is free to utilize this space, a move designed to promote social interaction, bringing people together rather than keeping them apart. 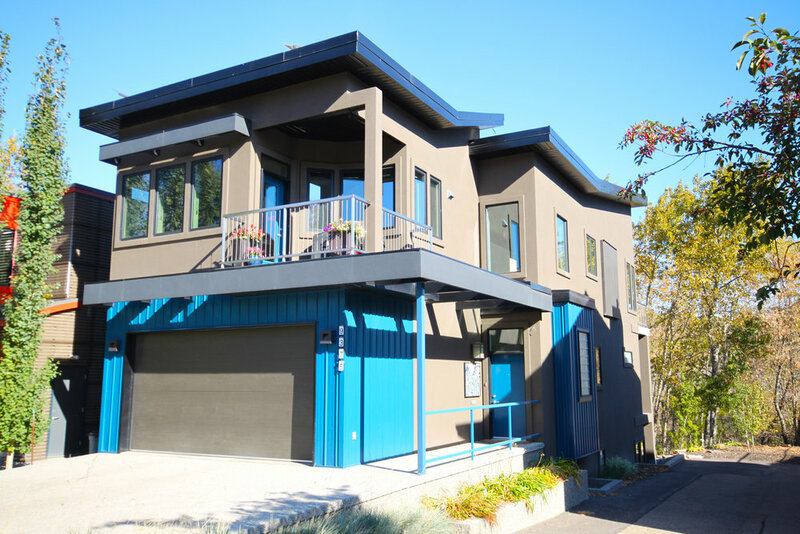 Local architects and homebuilders were invited to design affordable, innovative housing for a city-owned lot at Baldwin at 12673 – 72 Street, allowing more flexible land use. At least one unit had to be suitable for families with children. Eight local teams of architects, designers, and builders submitted proposals that included two or three units of housing on the site. The five-person jury considered each entry’s affordability, effective design, livability, neighbourhood fit, and innovation. Winner of The Affordable Housing Demonstration Project in 1994, the tri-plex was the result of an open competition, initiated by the City of Edmonton Planning and Development and the Innovative Housing Committee. Its goal was to provide affordable and innovative duplex and triplex solutions for an inner city lot 35’-0” wide by 120’-0” long. Completed in the fall of 1995, it is still fully occupied. 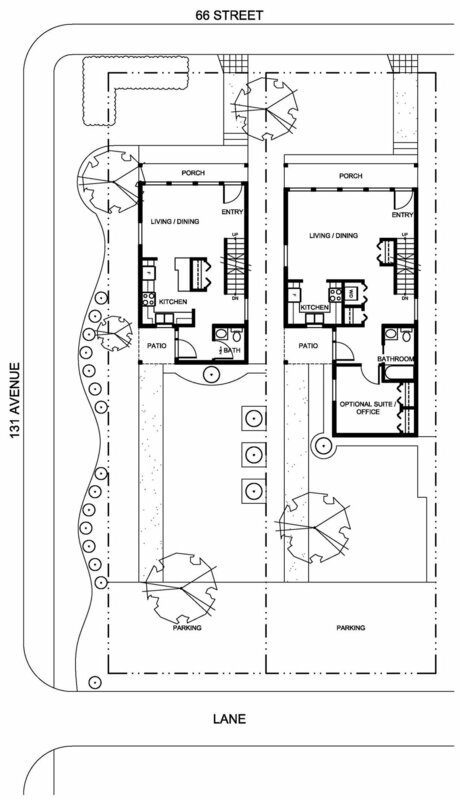 The above drawing identifies the main floor plan complete with the ground floor of the two-story home and the ground floor accessible dwelling. The resident of the accessible dwelling can visit the other home from the back door facing the courtyard where there is a no-step entrance. A simple flow-through circulation pattern is enabled with the absence of hall in the plan. Efficient use of space is notable in this design, as an outcome of lived experience. 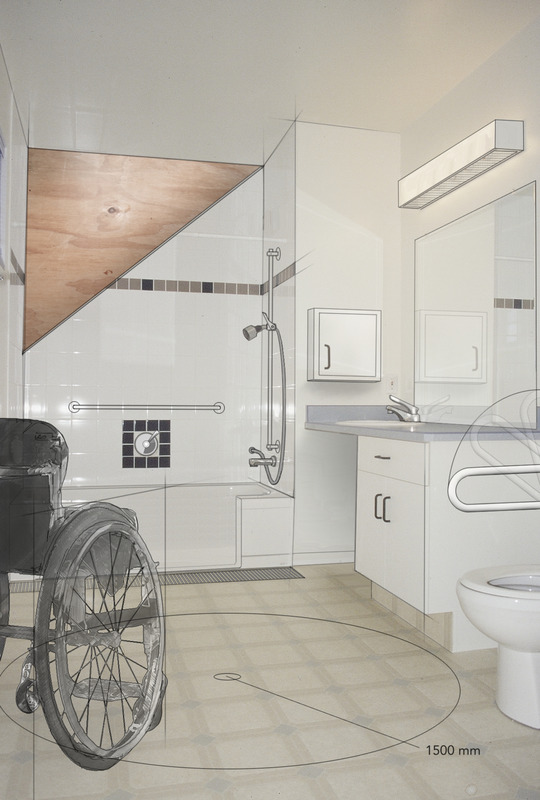 Designing to accommodate wheelchairs, which need more turnaround space, challenges architects to produce innovative solutions, which may be just outside the realm of what is considered the norm. The project was designed to accomplish several important goals not usually addressed in Edmonton’s housing market. It had to accommodate low-income families, single parents, shared accommodations, seniors, and individuals with disabilities. Its flexibility allows one family to occupy both buildings, encouraging multi-generational housing: extended households, which include grandparents, young families with children or young adults living independently with disabilities. Alternatively, two families can each occupy a building, or three separate families can inhabit each unit. The above drawing identifies the second floor plan of the two buildings. With limited circulation space within the units – the smaller unit is 24’-0”by 24’-0” or 576 sq. 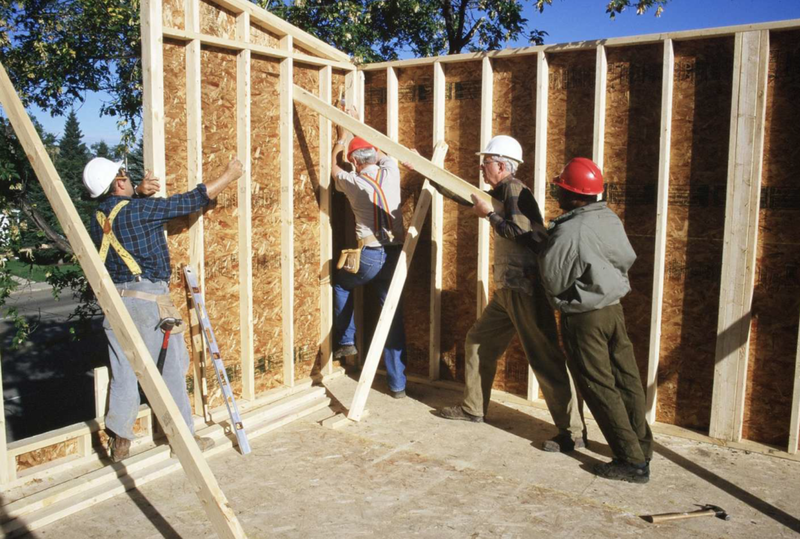 ft. and the two-story unit is 24’-0” by 32’-0” or 768 sq. ft. – allows for critical larger closet and storage space. The integration of a courtyard into the design promotes social interaction rather than isolation. With an aging population and reduced institutional care for the elderly, the idea of an accessible granny suite like this project offers is timely. The above image shows the integration of this housing project into its existing neighborhood. It can be seen as an illustration of successful community infill, encouraging inner - city communities, which are often deserted as urban development continues in the suburbs. In my housing models, I try to provide for both privacy and socialization. The future of accessible design in the community is accessible community design: creating communities that are more accessible for everyone. This design fits into the existing streetscape, yet at the same time sets the tone for what future development could look like. Features like on-grade access, open floor plans, a lower kitchen counter, lever door handles, grab bars, accordion closet doors, and adjustable rod and shelf heights all help a variety of individuals. The strategic uses of color and contrast plus changes in texture of ground and wall surfaces serve as visual and tactile cues for those persons with visual and cognitive limitations. This project designed with sustainability, adaptability, and flexibility makes it suitable housing for seniors and for people with disabilities. Their maximization of space, incorporation of light and proximity to the amenities typical of inner-city housing enables the residents to age in place, a growing concern among the number of seniors among us. Community, rather than isolation, is an essential ingredient of their continued vigor and mental health, despite their abilities. The image above shows the street facing home complete with the address sign of high contrast white and black lettering. The image above shows the kitchen area of the ground level accessible dwelling. Most of the counter height is the standard 3’-0” from the floor. A lower counter, which is open underneath extends into the living space. The counter can serve as a workspace and eating area for someone sitting in a wheelchair. The sink is open underneath for easy wheelchair access.